Rinse rice for 2 - 3 times. Add water, rice, ginger and chicken tights in a pot. Bring to a boil, turn down the heat, let simmer for 1 hour. Stir occasionally to prevent sticking to the bottom. Add salt and wine, stir and simmer for ½ hour or until the rice is mushy. Turn off heat, remove chicken tights from the pot, shred the meat and discard bone. Return chicken meat to porridge, stir to mix. Garnish with sesame oil, pepper powder and sliced scallion as desired. Serve immediately while still hot or warm. 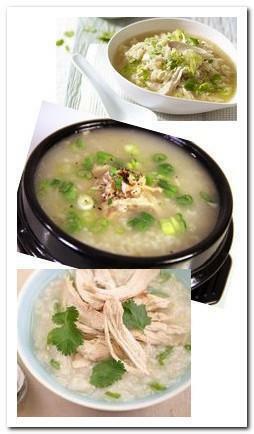 Chicken porridge (congee) is gentle on the digestive system and the carbohydrates from the rice serves as a good energy source. It can be served simply with the shredded chicken meat on top, or cook with pieces of chicken meat. Extra seasoning of a little soy sauce and pepper powder can be added to chicken porridge depends on personal preference when serving. Chicken porridge always garnish with spring onion and fried shallot.